You should view a slope as a natural opportunity to turn a plain yard into something extraordinary. Like you, I have also read articles on landscaping a slope and enjoy the variety of different perspectives. They all have valuable information for their readers, and it allowed us to focus on something different and unique for ours. A flat yard can actually be more challenging to design than a sloped yard, because landscapers and designers have to “force the site”. 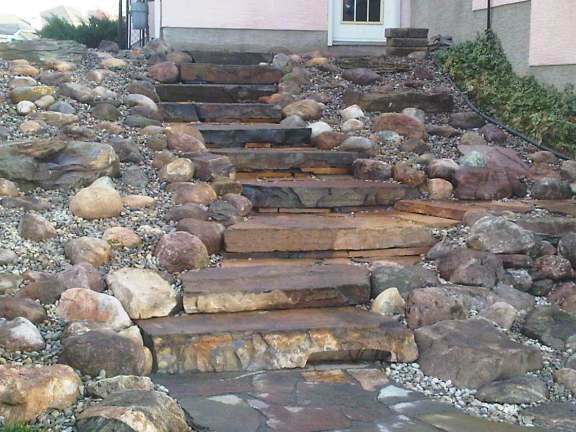 Rock gardens, waterfalls, garden beds, retaining walls, and other features can be blended into a sloped yard naturally. I used to get excited when I arrived at a clients house to see some contour to the yard. I could quickly visualize an extravagant yard with natural stone walls, garden beds, and yes, don't forget the waterfall. When landscaping a slope, working with a good designer may be worth your while. They can take your ideas, and blend them with their experience and expertise to come up with something that is functional, practical, and beautiful. They can also help you to work within your budget. Landscaping a slope doesn't have to be complicated. 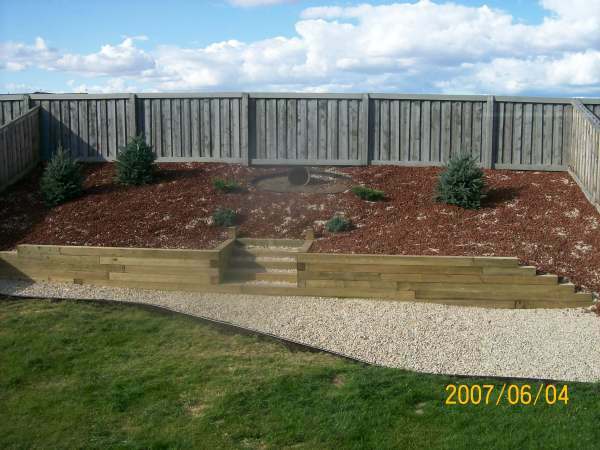 This very simple idea of large rock retainers and mulch is affordable and practical. It can also be expanded on at any time. Picture ideas are a great place to start. You can browse through our own photo gallery, or you can check us out on pinterest. There we have over 16,000 pictures in over 90+ different landscaping categories. We have a link at the top of the page for Pinterest. After you have some ideas in your head, check out our other helpful articles like, Landscaping Planning. This is full of great tips on things that you will encounter before you begin any project. It points out issues like, underground utilities and lines, access to water or irrigation, dealing with permits, and working with existing levels and drainage. We refer to this article as “thinking like a landscaper”, these are things that may even require you to modify your landscape plan or design, so it is important that you aware of these things before you begin. They are quick reads that can save you hundreds, or thousands of dollars. If you require a more basic understanding of design concepts, you can visit our article on back yard landscaping. This is a great beginner article for understanding the concepts of design. So let's get into a little more meat and gravy about landscaping a slope. When using retaining walls in slope landscaping, you may require an engineers stamped approved plan. (This depends on the height of your wall.) This usually applies to walls four feet in height or over, but can vary from one city to another. You should check on all by-laws and construction related permits before you perform any work in your yard. Some cities and towns have some pretty restrictive laws, and it is up to you to find out what they are. Special materials like "Geogrid" are commonly used with engineered retaining walls. Some cites may not require an engineered plan, but could still require a permit for building a retaining wall. This is becoming more common as cities don't want to miss out on what improvements you are making to your property. I can only imagine this is quickly passed off to the assessment office. Don't bite off more than you can chew when landscaping a slope. Walls like this will usually require the services of an expert and possibly even an approved engineers plan depending on the legal height requirements for your area. For those of you with steeper slopes we recommend using the services of a professional landscape contractor. This is due to understanding certain forces of nature. Soil and water both exert pressure against walls that can cause them to fail, and heavy surface water can cause erosion or slides. Proper procedures must be followed in the construction stage. Frost heave is the complex series of events that results from freezing and expansion of water. It is a little more complicated than most people think, and once again water control is essential. Soil creep, or downhill creep is the ability for soil and rocks to move down slopes in relation to friction, and gravity over time. Although this is a slow process that you will rarely see, you will see the long term effects. Slide planes are created below the surface when heavy amounts of moisture accumulate. 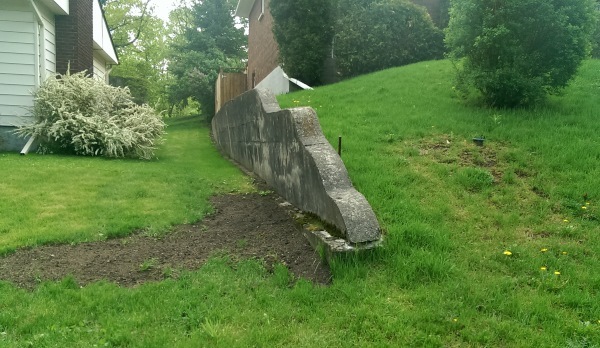 Retaining walls will fail over time if the proper preparation work is not done when they are installed. Sodding a steep slope may not be the most practical choice. You don't need to fully understand the technical information behind each of these forces. (I don't, and probably never will.) You do need to understand they exist, and the steeper the slope, higher the wall, or more water you are dealing with, the more you will require the services of an expert or the use of a stabilization fabric. 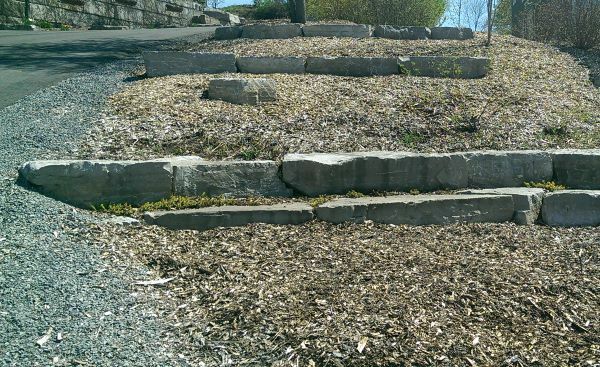 This low natural stone retaining wall with staircase creates interest in the yard by making the lawn space multi-level. Tiers or levels are a great way to deal with slopes. Choose plants or trees with deep and extensive root systems to interlock with each other at different levels in the soil. This will create a more stable bank by preventing soil creep. Soil stabilizing can be done many ways by using both mechanical and chemical stabilizers. Anchors, nails, geogrids, nets, etc... are some of the ways you can stabilize soil on a steep slope. On wet slopes, moisture loving plants will help stabilize the bank by taking up excessive moisture. With the above in mind, you still need to know that anything you add to the slope such as large boulders, rocks, and even large trees will also add weight. The best way to add heavy features like this is to dig small ledges to place them on. Water actually acts as a binding agent in small amounts. A great example would be building a wet sand castle compared to a dry one, but balance is the key. Excessively heavy amounts will have the complete reverse effect of a binding agent like in mountain landslides. With landscaping a slope, water control is very important in avoiding surface erosion and hidden slide planes. Dry arid regions present a different challenge. Slopes usually don't hold moisture very well, so finding plants that require little or no water is important if you haven't installed irrigation. When landscaping a slope in the desert you still may have to implement water control for heavy rains. They may not be as frequent, but can still cause damage. Rock gardens set in gravel beds, and dry creek beds are great ways to control water during times of heavy rain. Make sure you can maintain what you design. When landscaping a slope, it may be difficult to mow or maintain. Grass may not be a practical ground cover unless you have good irrigation. Grassy slopes often dry up, and burn very easily in the hot summer months. There are a few different ways to make hillside landscaping more functional. One way is to use retaining walls which will create level areas or terraces above the wall. 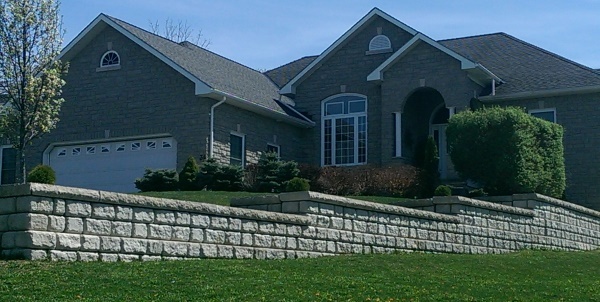 Terracing is simply using more than one retaining wall to create a series of levels. You can incorporate stairs to access and maintain each level. We talked about walls over a certain height may have by-laws or building codes requiring them to be engineered. You can avoid having one large engineered wall by terracing, but make sure you know the required distance of how far apart each wall will have to be. Most cities will have a building requirement for this as well. Terracing has been used by many ancient civilizations to make hillside/mountainside farming productive. From Italy and China, to the Inca's of Peru, they have all employed this method with great success. 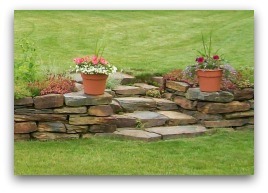 Another effective way to work with landscaping hills is by a building a nice rock garden. This is one of the most attractive, affordable, and easy ways to deal with slopes. It is also within the scope of most do-it-yourselfers. There are some drought tolerant ornamental grasses that make great additions to rock gardens and slope landscaping. Landscaping a slope also means you are going to have to be able to access what you install. Try adding a set of stairs or a pathway to safely navigate the area. If the slope is large enough, consider a series of switchbacks made of gravel pathways. I have used landscape fabric on some pretty steep slopes, but there are a few things to consider when you do. Landscape fabric can create water "runoff" robbing the plants in the hill of moisture depending on the type of fabric you use . You may have to install irrigation for your hillside plants, or a filter cloth type fabric barrier around them. Sometimes a combination of landscape fabrics can be used. Oxygen and moisture will not penetrate into the soil around your plants with woven polypropylene like it will with filter cloth. Use filter cloth around the drip zone of your plants. Be positive and enthusiastic about having a slope to work with. Be imaginative and create something unique. Be aware of the forces of nature and only tackle a job you are qualified for or feel you can do effectively. (Leave the rest to professionals.) Be aware of construction by-laws in your area before you begin with retaining walls. Design the slope to be practical and functional and make sure you can access and maintain the area. Select plants/trees/shrubs carefully for their root systems as well as their ability to handle drought in dry climates. Have an effective plan to control water above, and below the surface. If you are looking for ideas, please visit our Hillside Landscaping Ideas Photo Gallery. We hope you have enjoyed our approach on landscaping a slope. If you have, please pay it forward. If not, please let us know. We would be happy to add your comments on this subject, and we are always looking for ways to improve our site. For more tips on working with landscaping fabric please visit Landscape Fabric Mini-module. For more tips on building stone walls visit our module on Dry-stacked Stone Walls. Check out our time and money saving tips for Landscaping.